Hello! 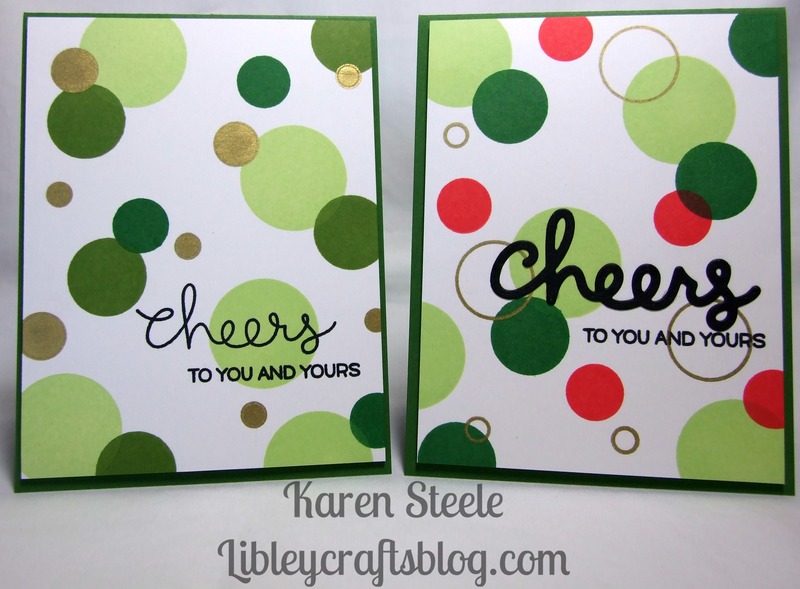 I’m back today with a couple of Christmas cards that I have made using lawn Fawn’s ‘Let’s Bokeh’ stamp set. I got the inspiration for these cards from watching a You Tube video by Nicole Spohr. 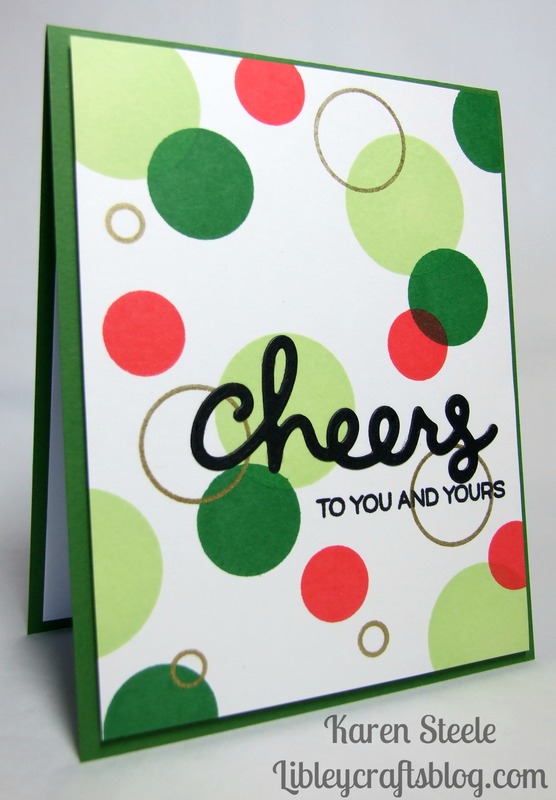 Actually, these could be for any celebration – if you omit the ‘to you and yours’ stamp! These were pretty quick to make – great for batch making- and it’s a couple of more cards for my Christmas stash! The thing is at the moment I keep getting distracted from the larger family cards I should be making as I’m really enjoying making smaller cards at the moment. Never mind, I’m sure I’ll get them all done…eventually! Supplies used: The following Memento inkpads – Tuxedo Black, New Sprout, Bamboo Leaves, Cottage Ivy and Lady Bug. Also, Tsukineko – Encore! Ultimate Gold Metallic Ink. 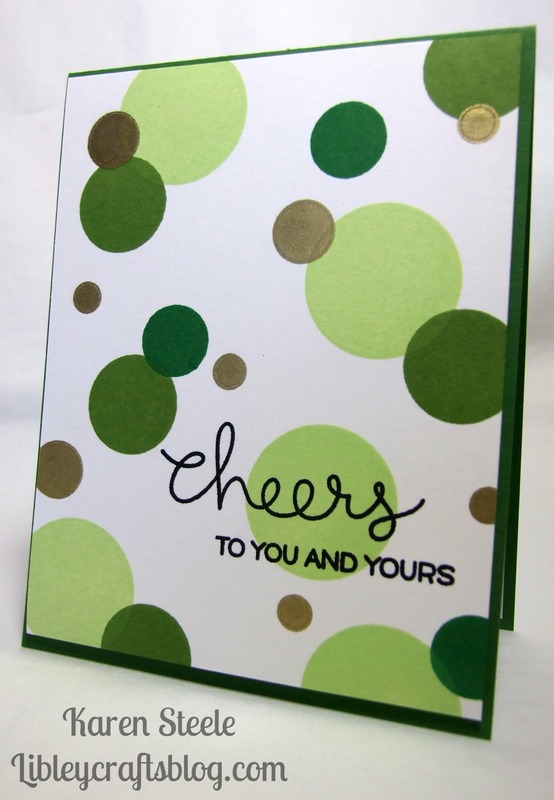 Lawn Fawn ‘Cheers’ die and green cardstock. My MISTI. Fabulous Cards, Karen and they are quick and easy to make. Perfect for a mass production ! Fabulous cards, Karen! Love the fun design! These are great! Perfect for mass producing like we so often do for Christmas cards! Looks like it is Lawn Fawn Day today! Love these. The circles work so well. As you say, they could be for any occasion. Pretty darn cool, Karen! FUN! I have that stamp set too but haven’t done anything so fun. Turning them into Christmas cards was great!! Love them! Such original and cool Christmas designs! There’s something festive and 70s like about these, love them! Love these cards. They are so fun but look clean and crisp. Great to have a style that you can mass produce.